Update September 23, 2016: Real Time Penguin is now live! Google just announced on their official Webmaster blog that after a period of development and testing, they are now rolling out an update to the Penguin algorithm in all languages. Aside from the fact that Penguin’s data is now refreshed in real time so that changes will be visible much faster, Penguin is now more granular. The Penguin algorithm will be able to devalue spam by adjusting ranking based on spam signals, rather than affecting the ranking of the whole site. Is My Website Affected by the Real Time Penguin? Alerts you as soon as unnatural link activity is spotted within your website. 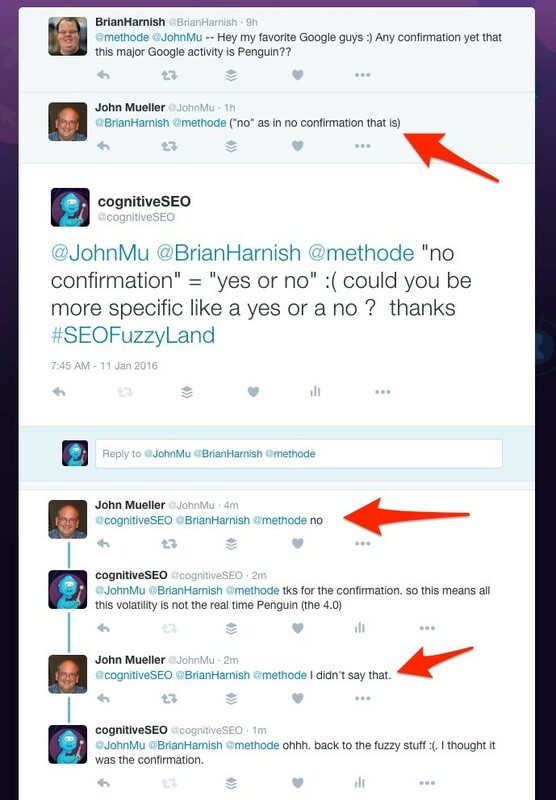 Google’s John Mu posted a very fuzzy response on Twitter minutes ago neither confirming nor denying the release of the Google Penguin. This makes me think even more that the update is Google Penguin. Else why would he not confirm that it is not. First UPDATE 11 Jan After this was posted we got a more straight answer from JohnMu saying that they do not have anything to announce yet. Still does not confirm positively or negatively this. More tools report this high level of volatility in the SERP worldwide. Also lots of discussions on Webmasterworld during the weekend about the Penguin 4.0 update. The opinions seems to be mixed about Penguin there. Barry Schwartz reported on Seroundtable, on Sunday in a Special Report, about the SERP fluctuations. The real-time Penguin would allow webmasters to recover their sites much faster.At the same time it will penalize spammy link profiles on an ongoing basis. In the last couple of years we, at cognitiveSEO, have learned a lot about unnatural links and penalties by analyzing lots of Penguin penalized sites. Using the Unnatural Link Detection in the Google Penguin Recovery Tool, cognitiveSEO can help you recover and protect your website from Google Penguin 4.0 or any other link related penalty. As stated in the beginning this was not officially confirmed by Google. When we have an official answer I will update this post as we get more information from Google’s representatives and from the community. It may be that this is not Penguin, even though it is highly unlikely based on all the reports we see. It could be another Google update. still not here yet. but this is a good time to start tracking the penalty risk. looking forward to see it go live. Thanks for the info and updates. It’s always hard to tell how these updates will affect rankings and sites. Just keep practicing sound backlinking methods. Google doesn’t want to say anything, but I think that this may be Google penguin and they don’t want to announce it yet. We can’t be 100% until we get more feedback from Google, I guess we’ll find out what this is in the near future. Thanks for the update Razvan! That’s why, Because Penguin always burry million of websites on its update. And i found still many spammy sites are getting ranked in serp. don’t panic, nothing’s happened — Google just played with its core 😉 ! This will cause serious problems!!!!! But this news is not confirmed yet. I noticed the fluctuations including on our websites’ rankings but it never crossed my mind that another Penguin update was rolled out. Thank you for shedding the light on this matter. Meh, no sense in getting worked up about “Penguin” all the time. Just assume that there’s always going to be a Penguin update tomorrow and act accordingly and you never have to worry about it. Google updates are like a box of candies. But, instead of a sweet treat, you get new articles and information that you have to study. It will be much fluctuation in SERPs for spammers and bloggers who dont know about quality works. Let see what happens. SERP will do dance soon. It may happen that penguin update will much beneficial for quality SEOs. it should be as spammy sites will rank lower (or not at all) and quality link profiles will boost their own rankings. not to mention the possibility to recover your sites if they are penalized. I just seen this article on my inbox and got to know about google new algo update on penguin..im amazed to see there will be real time penalty and thats a good news..its interesting..
Now onward only quality SEO are going to establish (rock) in Market !!!! Those who though that SEO is Copy & Paste or Data entry work, now this is the time to upgrade them self or change there field !!!! rankings updates will be seen as Google re-indexes all your sites links. Thanks for your outstanding blog with statistical illustration. 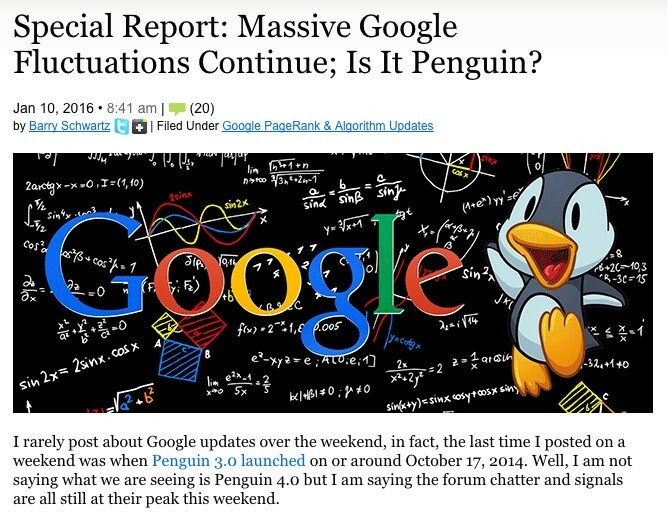 To be honest, google was testing penguin 4.0 beginning of September. We were getting huge fluctuations on SERP. Google officially introduce on 23rd September. Anyway, hope, this new update will bring quality outcome for search. indeed. there a lot of reports similar to yours. surely they’ve been testing it before making it public. it is a big update and they needed to carefully analyze the impact. that’s the way Google launches updates … when people least expect them. Does each country different start date? le’s see how this develops. I am little confuse what should i do for recover my website ranking after real time penalty. you should first check your penalty score/risk and the number of unnatural links. you can do it with cognitiveSEO automatically or you can do it by hand taking each and every link to manual investigation. once you did this you can do a disavow if you did not already. in the meantime if you did not do it yet you need to dilute your link profile and create strategies that will bring natural and organic links pointing to your site. No more speculation it’s here… or is it? Is this true this Google Penguin 4.0 doesn’t penalise for bad links but it ignores/devalues the spammy links adjusted its ranking. as Gary Illyes says the algo is devaluing links but there is still need for a disavow to help them understand your unnatural links better. For manual actions is a must. After a long time, Finally it comes let’s see what would be happen with new run time Algo….. Apparently Penguin 4.0 is now operational for all pises and languages. They are noticing several fluctuations in the rankings. I wouldn’t say that all unnatural link profile sites were punished yet. I saw a lot of example of SPAM still ranking high in the SERPs. might be. I also have seen in Romania that a lot of junk is still ranking. Seems like Penguin is rolling out in a pretty rapid manner now. There are serious fluctuations in the rankings. One of our clients seemed to lose traffic, and simultaneously saw higher conversion rates. We are waiting to find out if overall online sales numbers are increasing over the baseline we are looking at, an initial glance shows that appears to be the case. Thought that was interesting food for thought. keep an eye. they are still rolling it and my feeling is that there is a mix of updates. not only Penguin. Penguin 4.0 is slowly rolling out and its real time that with effect the web pages of site. Each day the page is crawled or index the page get refreshed. Thanks for sharing about Penguin 4.0 update. Hope to get more interesting content from your side to read in future. Massive SERPs changes this time. hoping for goo! can you share some sites that had fluctuations? on the serious side. G wants to have full control on the rankings and they don’t want third parties to manipulate their rankings in an evil way. First I would like to appreciate you for this awesome information. I have a question that how much penguin will effect an exact match domain. not sure if a difference was done on EMDs but I have seen an example of an EMD that was pushed down with this update. you should check starting with the date of 23rd of Sept 2016 and see if your rankings had a drop or increase. Penguin is still rolling so these can be seen also in the following days. Only for SERPs changes this time. For the moment, no client of mine was hit by Penguin 4.0. It’s actually common sense and not go risky profile links. Everything can take its toll over time !. Interesting… Hope it doesn’t effect it to much. Even I have seen so much fluctuation in many keywords. But I am not able to find whether the new penguin update has affected or Not. Thank you for the post. All of the points in the post is very much useful ones though I have my doubts on disavow links. I think if we can understand the relation between panda,penguin and rankbrain half of our battle is won because I know this for sure that rankbrain has a huge significance when it comes to rankings. The disavow tool is recommended by Google when you have a Manual Penalty or you want to tell Google to not take in consideration a special set of links (due to an algo penalty or maybe negative seo). How many days will updates, because ranking is fluctuating every time. plz share the ending date of Penguin 4.0. suggest me what can i do to improve the better result. I have lost few of my organic traffic. I’m guessing that it might be due to the unnatural links. Wanna recover it. We sumbitted disavow links but nothing happen for yet for several websites. How long it takes the reconsideration? With every new Google Penguin version, spamming sites in abundance have been terminated. Sure there won’t be any other update of Penguin in the future considering the company has shifted it to the core algorithm, it is concerning for every trifling website to protect itself. Interesting Google Penguin Penalty check tool. Will start my trial today! My web site is fluctuating for 1 week. It looks like it was spinning normally today. We noticed significant drops in some of the sites we tracking but not as they launched the penguin 4.0. Now its live so basically now you make bad links & get the instant punishment.. 🙂 Surely its nightmare for spammers . Thanks For Sharing This Article to Keeping us Update on Panda! Thanks for update my several sites are affected,which i have recovered keep eyes on penguin. I don’t think penguin will affect the websites obey white hat operation. After many times updates, I found Google tried to remind us the content is the king. It is very useful information at my studies time, i really very impressed very well articles and worth information, i can remember more days that articles. Now it is known to me that articles is nothing but inspiring is everything to do something great. This is a great article for the people who want to come in freelancing. Totally Agreed, How can we follow these instructions to avoid the SERP fluctuation? Can anyone tell me about next penguin update when it will come and roll out? We have observed that Big Brands are following the SERP. For some of the clients, we have seen that some of the big brands are getting top positions in SERP. I have checked this update I was safe at all now waiting for the next Penguin update. But many spammers are still on no.1 I don’t know what’s happening. Good article on the Penguin update. And thanks for using some good info graphics and pictures that help explain this. It makes it easier to understand. I’m going to check out your unnatural link detection tool. It’s correct. penguin update is effecting now. Someone saw some changes in eastern europe? Anyone knows when google next update will come? Penguin slightly shuffled websites in Poland and in the world. My site lost 25% on these changes. Leave a Reply to Karva Chauth!